This is our third part of a series of posts on (a few selected) hidden realities : many-worlds interpretation of quantum mechanics, multiverse linked to the space-time geometries and dynamics, higher dimensional multiverse, holographic multiverse and simulated multiverse. This time, we’ll enter the world of higher dimensional theories. Electromagnetism is the study of the electromagnetic force which is the physical interaction that occurs between electrically charged particles. The electromagnetic force is one of the four fundamental interactions, the ones being the strong interaction, the weak interaction, and gravitation. Which is simply amazing ! Electromagnetism, conceived in the 1800’s, is a relativistic unified theory that one can also turn into a beautiful quantum theory. Let’s get back to the early 1920’s. At the time, only two fundamental interactions were known: gravitation and electromagnetism, the latter being a theory unifying electrical and magnetic interactions. It was on logical to try to unify gravitation and electromagnetism as James Clerk Maxwell did 40 years ago at the time. This a stunning result. But it has (at least) one drawback: what to do with this 5th dimension that nobody has ever seen ? In 1926, Oskar Klein (the physicist, not the other Klein who’s bottle is so famous) dipped Kaluza’s theory into quantum physics. He’s idea was to curl this new dimension up to microscopic scale. This idea is nowadays called compactification. The 5th dimension (which would be a 4th space-like dimension) is curled up in a circle of an extremely small radius (10-35 m): in every point of space time there is one extra dimension rolled-up into a circle. In modern geometry, this extra dimension is understood as a circle group U(1), precisely enable theorist to formulated a gauge theory on a fiber bundle with gauge group U(1). One sees how it could be generalized to the SU(3) x SU(2) x U(1) symmetry group of the Standard Model of particle physics and include the other fundamental interactions. But, it turns out that Kaluza-Klein is flawed… For example, it leads to a calculated mass of the electron many orders of magnitude greater than the measured one. Too bad. Even if Kaluza-Klein theory turned somewhat sour, higher dimensions and compactification turned out to be seeds of new theories. even Edward Witten‘s M-theory (which unifies 5 string theories) requires 11 dimensions. Somehow, the natural progression was to add more dimensions and see what happens when it is compactified. 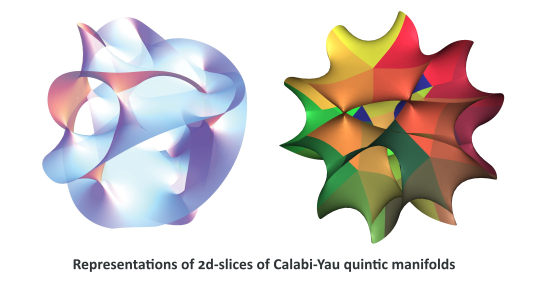 If the compactification possibilities have been narrowed down to this type of shape, it still leaves a huge (possibly infinite) number of specific shapes. Even though there theories are technically quite different from Kaluza and Klein’s , the coupling constant of string theory, which determines the probability of strings to split and reconnect, can be described by a field called … dilaton. Moreover, physicists have speculated that the graviton, the particle carrying the force of gravity, may “leak” into the fifth or higher dimensions, which would explain how gravity is significantly weaker than the other three fundamental interactions. This is a beautiful idea. My subjective opinion is that string theories (as they stand now) are more exquisite mathematics than real physics. But some of its ideas (and mathematics) are probably the seeds of news fruitful theories. In 1993, Gerard ‘t Hooft put forward the holographic principle, which explains that the “information about an extra dimension is visible as a curvature in a space-time with one fewer dimension”. Familiar holograms are three-dimensional pictures placed on a two-dimensional surface, which gives the image a curvature when the observer moves. Similarly, in general relativity, the fourth dimension is manifested in observable three dimensions as the curvature path of a moving infinitesimal. ‘t Hooft has even speculated that the fifth dimension is really the space-time fabric. We will speak a bit more of the holographic principle on our next post. For once, let’s forget films, and let’s talk literature. 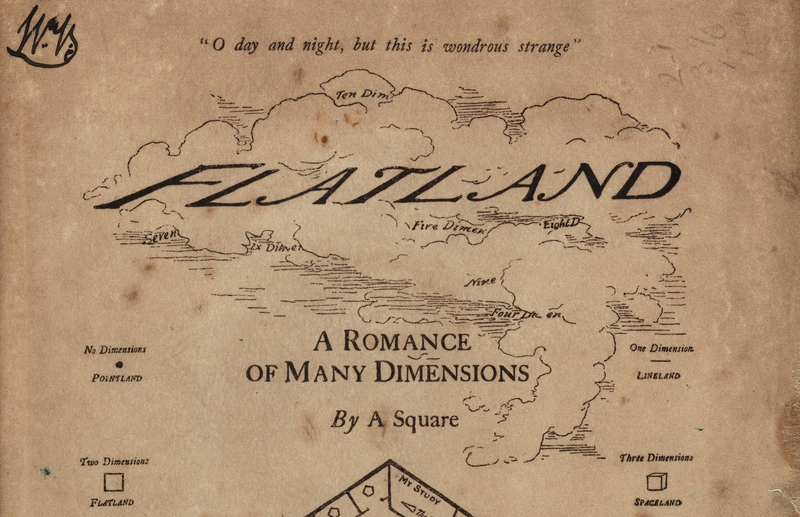 “Flatland: A Romance of Many Dimensions” is an 1884 book written by Edwin Abbott Abbott. The author uses a fictional two-dimensional world baptized Flatland to satirically comment on the hierarchy of Victorian culture. —from a “Letter to the Editor” by William Garnett. In Nature on February 12, 1920. In 2001, Ian Stewart, renowned popular-science writer, published “FlatterLand: Like Flatland, only more so” as a sequel to “Flatland”. It is a travel in the “Mathiverse”, a set of all imaginable worlds, visiting higher dimensions modern theories, and ending the “Domain of the Hawk King” to discuss time travel and the theory of relativity.